Our heroes are dressed in homemade uniforms and armed with prop phasers but soon find themselves defending their hotel and convention center against hordes of flesh-eating undead. Suddenly, all of their useless knowledge about particle physics and old Star Trek episodes has genuine real-world applications! And while hotel employees and regular civilians are dying left and right, our Trekkies summon strength and courage by emulating their favorite starship-voyaging characters. 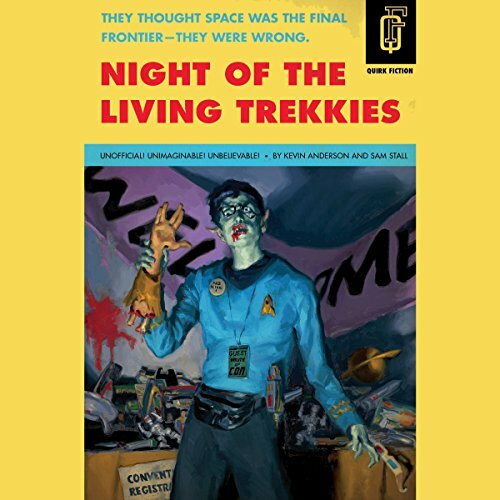 Packed with hundreds of gags referencing Star Trek, comic books, and fan conventions, Night of the Living Trekkies reads like the strange lovechild of Galaxy Quest and Dawn of the Dead. Journey to the final frontier of zombie science-fiction mash-ups! This is an original work of parody and is not officially sponsored by, affiliated with, or endorsed by the owners of the Star Trek brand. Truth be told, most zombie fiction is pretty bad. Whether it be the poor writing or bland characters put into cliche scenarios, I tend to put down most of these books rather than finish them. Thankfully, this book avoids a lot of the pitfalls and tells a funny albeit dramatic story about Star Trek fans trying to survive a zombie apocalypse. It's a fun read for sure, and if you're a Trekkie, you'll love all the Star Trek references scattered throughout the pages. Each chapter is named after an episode which works most of the time. The wonderful thing about this book is that keeps its eyes always focused on the story. The characters feel real and their encounters can be gripping and sometimes tragic. The concept, while funny, is kept in check by the author's attention to plot and character. Honestly, this could have been a disaster with lesser skilled writers, but instead, it was a refreshing read that I highly recommend. Trekies vs Zombies, I Loved This Story! Today, all my gentle readers get to find out one of my secrets … I am a closet trekkie. Being a lover of the original Star Trek series and a lover of good zombie stories, I thought the two together would be very amusing. This story was a perfect mix of the two. The authors were great the way they snuck in little bits and pieces of different Star Trek trivia into the story. I especially enjoyed the way the trekkies started fighting off the zombies with the different Klingon weapons. The zombies are from a brave new world and they are seeking out new life and new civilizations … oh wait … sorry I slipped for a moment there. The main hero in our story is named Jim (no not James T. Kirk) and he is a closet Trekkie. He is working at a hotel where a Star Trek convention is being held. He was once a military soldier, but now he just wants to sit around and mindlessly do his job. When strange things start happening in his hotel, he can no longer sit back and do nothing. His sister has come to the convention with a bunch of her friends and Jim must find a way to make sure they get out of the hotel alive. If you are a Star Trek fan, I highly recommend this book. It is a ‘must have’ for all Trekkies. If you are not a Star Trek fan, it’s not too late! If you are not a Star Trek fan and don’t want to be one, but you are a zombie fan, you will love how lots of trekkies eaten or turned into zombies. 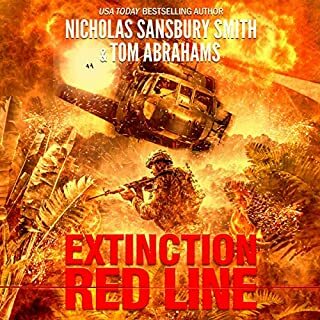 My Rating: 5 Stars … I loved this book! Night of the Living Trekkies was the story about a bellhop that used to be an ex-Military-esque person who, during a Star Trek convention, has his hotel flooded with zombies from outer space. I had to have my mom explain a few references to me, but for the most part I’m enough of a mini-Trekkie myself to understand them. The book was HILARIOUS! I simply adored it and was thrilled when I got to listen to it with my mom when we were in the car. The voices were perfect for every situation and the Star Trek humor just about made be bust a gut laughing in several different places. The ending was great, and I have to say my all time favorite character was ‘Willie Makeit’. 5 out of 5 Stars. May this book live long and prosper. 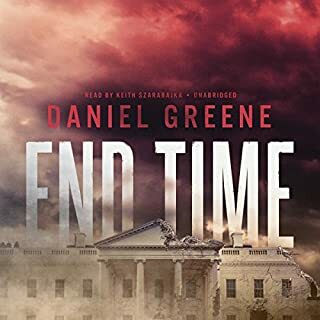 This audiobook was narrated by Zach McLarty and he had a great cast of voices tucked in his trekkie belt. I think he must be a trekkie because he did really well imitating the Klingon voices. It was very enjoyable listening to him telling this Star Trek-Zombie tale. Having grown up with Star Trek and a love of zombies, this story was a good listen to me. There was a lot of humor and action and a lot of"trekkie" trivia. Lighthearted zombie mayhem at a Trekkie convention. You don't have to be a Star Trek fan to enjoy it. All-round good fun. 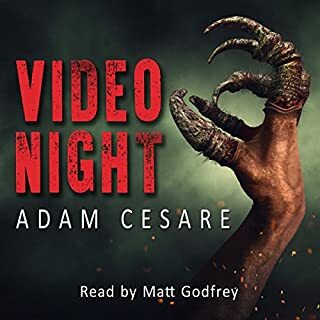 Where does Night of the Living Trekkies rank among all the audiobooks you’ve listened to so far? Night of the Living Trekkies is one of the most fun audio books we've listened to so far. What was one of the most memorable moments of Night of the Living Trekkies? You don't have to be a trekkie to enjoy this book. Sure it would help, but it's not nessesary. My wife loved it and she's not a trekkie at all. You have it all in this one. Couldn't have been better. It seemed a little slow at first but once it got going I was happy. The reader did an excellent job and the production was top notch. Hope they do some more like this in the future. As you would expect with a title like this it is funny and if you are a Star trek fan you'll like all the references. Zombies at a Star trek convention you gotta love that! Just finished yesterday, and wanted to write this while it's still fresh in my mind. I thouroughly enjoyed it. I often smiled at the Star Trek references, chapter titles, and inside jokes. I did not see the glaring errors in science or Trek Mythos mentioned by another reviewer, but I am a "casual Trekkie," not a die-hard. If they make a movie, I'll go see it, but the target audience may be too small for them to do so. Overall, I enjoyed both the writing and the narration. However, my one beef is pronunciation. I'm assuming Zach McLarty is not a trekkie, just a guy hired to read it. 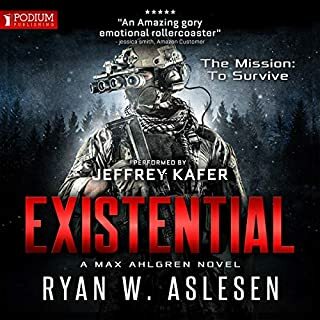 Again, I liked his narration overall, but there were a few glaring pronunciation errors that I wouldn't expect in such an audiobook, where the target audience is known for their nit-pickyness. Pronouncing Guinan as "Gee-nan" and Bele as "Bay-Lay" are two that stand out most in my memory, but there were a few others that made me wince. Still, a fun read, and I recommend it. I found this book highly entertaining. It had so many elements of the genre, including a good amount of humor. I'm not a Star Trek fan, but I was still able to appreciate "the humor." Quite simply put, it was just downright great! 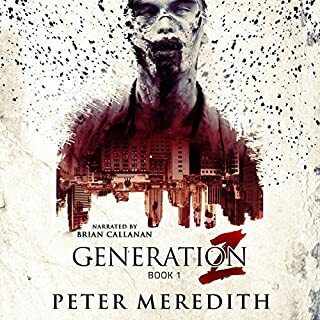 If you have read the Scott Sigler books, there is most definitely a connection with zombies from this book and the characters in Sigler's Infected and Contagious. However the book was so fun, I just didn't care. This book is hysterical satire. I laughed out loud. I read the audio version and the narrator made it even better. - or you wouldn't even be looking at this book! Not going to try to pr?cis the book suffice to say its fun, plain and simple. I didn't consider myself a Trekkie etc but the number of references that I picked up on leaves me to believe that a 'REAL' Trekkie would find so many more, well worth taking a on long road trip especially with like minded friends! Great humour, interesting concept, surprising heroes. 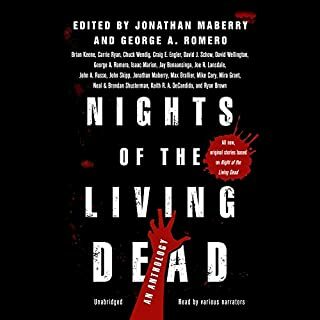 What other book might you compare Night of the Living Trekkies to, and why? What does Zach McLarty bring to the story that you wouldn’t experience if you had only read the book? Zach McLarty brings humour to the story but takes it seriously. The author has his tongue in his cheek if Zach had too it would have over done it. It's just a major, fun, surprise! Brilliant wishing for a second instalment. Hilarious in parts and you don’t need to be a Trekkie fan to enjoy. Buy and enjoy. Did you enjoy Hitchhikers guide to galaxy then you will-love this as it’s better. Wish there was a sequel or follow on to story. Buy and enjoy. however, this sounds like it is being read by a computer. has to stop it within three minutes. waste of money.